6 Step Meal Prep. How to Plan Healthy Meals for the Whole Family. Meal prep can be crazy overwhelming when you’re not even sure how to begin. With a family of 5, it’s super important for me to only spend one day meal prepping healthy meals for the whole family rather than take hours each day to get food on the table. Personally, I love cooking and creating new meals all the time. If you are not great in the kitchen then you have got to check out the $5 Meal Plan! This meal plan and grocery list was created by a busy mother of 4 designed to help other moms cook healthy and still stick to a budget! 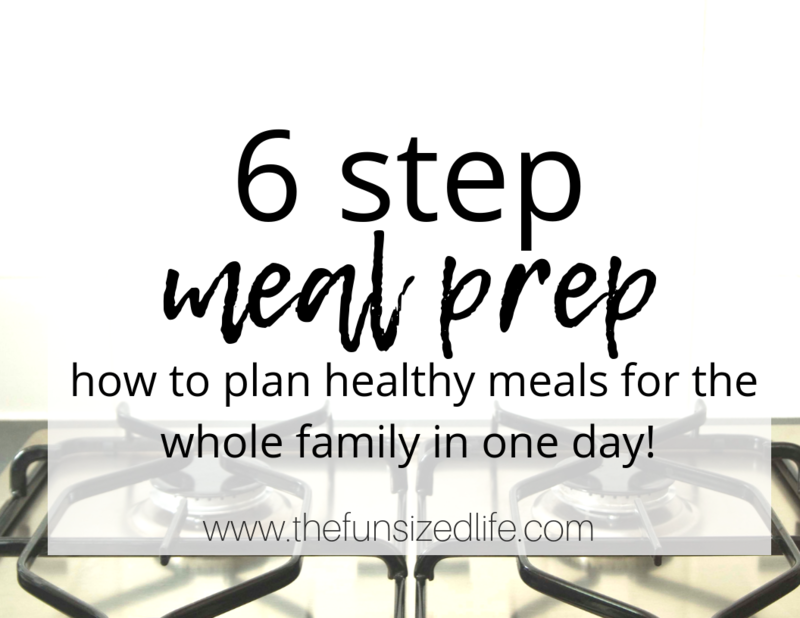 When you are all ready to prep follow along this 6 step meal prep to save yourself time and energy so you can get more time throughout the rest of your week! Getting a clear strategy down is going to help big time when you are in the kitchen. Once you get home you can get different “stations” set up to work on all the different aspects of your meal. Getting crock pot meals in as part of your meal prep is going to be super helpful because they are low maintenance. This will allow you to be hands on with other foods. For my crockpot meals, I usually pre-prep chicken bone broth from a previous meal prep session. Doing this gets me all set up to create yummy, hearty soups for the next week’s meal prep. No matter what you decide to make in the crock pot, you’re going to want to make sure this is the first thing you start doing. While everything in your crock pot begins to cook, you can start working on the other meals! After prepping your crock pot meals, the next step is to move onto the least low maintenance foods. For me this usually means prepping waffles, pancakes, bacon and hard boiled eggs. All of these things require quick prep time and longer cook times. This way I can get them started and while they cook I can focus on some of my other meal prep items. Before you start crock pot meals it’s a good idea to preheat the oven for any of your low maintenance meal prep foods. I always choose this option when prepping bacon. Meal prepping bacon by cooking it in the over is a way cleaner, less hands on solution. When it comes to meal prepping my low maintenance foods, I usually start with waffles. Once my waffles have been blended and are in the waffle iron, I will take this opportunity to get my bacon onto a baking sheet and got them in the oven. You can find the tutorial below for super crispy turkey bacon! Once you have both of these done, this would be the time to start boiling water in a large pot to make hard boiled eggs. Now you’ve got the crock pot going, bacon in the oven, waffles in the waffle iron and hard boiled eggs in the pot! Now that you have a little more focus, take the time to get the foods ready that require more attention. Like your seasoned meats or veggies. Like this awesome DIY taco season on Tomato Boots’s site. This is also the time to chop veggies, crush garlic or peel potatoes. Whatever it might be that you have planned for the week ahead. Remember if you have no idea what veggies to use or seasonings to start with, start with the $5 Meal Plan‘s easy to use meal prep guides! During this time make sure you are paying attention to your low maintenance foods! Pancakes and waffles may need to be flipped, bacon taken out of the oven and hard boiled eggs put into a big bowl of cold water to cool down! Now is the time you’ll find yourself with a meal in the crock pot, some meals prepped, some half way done and others cooling down. Nothing really requires your attention, so it’s time to kick back with some mindless work. Mindless work during your meal prep may mean peeling some meat off a rotisserie chicken. I love using rotisserie chicken for quick meal prepping. Other times I will even cook an entire turkey in one day! Cooking one turkey has actually allowed me to make 5 meals! Talk about easy! This is the part where you pour yourself a glass of wine and turn on some smooth jazz (totally kidding about that last part…unless that’s your thing, then rock on I guess!) Now your meats should be cooled, everything (minus crock pot meals) should be cooked and you can start storing things away for another day. We purchased a huge pack of plastic storage containers for all of our lunch meal prepping. However, we are now starting to work toward only using glass! If haven’t yet invested in quality meal prep containers, here are some awesome ones that you can get off Amazon! Haha well I’m glad I could help! Take a hike oatmeal! Hey that’s such an amazing post, I’m inspired by this and would be giving it a shot! So glad you enjoyed it Navneet! Good luck! I love using my slow cooker! It’s the only way I can make flavorful meals when managing two little kids. Your recipes look awesome! Exactly! Winter is the best time to take advantage of it too! These are so great! I make my own taco seasoning too! So many great ideas! I tried once years ago and thought it tasted too bland. Now that I’ve cleaned up my eating habits, I can’t imagine dealing with all the salt in the packets that I used to use! Right? This week has been a total breeze. I don’t know why I ever let meal prepping slide. It’s a must to help me keep my sanity! We just started doing something similar with freezer meals! Love how easy it makes cooking in the evening! Yes! It seems so silly but the concept of pre-prepping meat and then freezing was like total news to me! Can’t wait to keep up with it. I need to get back into meal prepping. It saves so much time! It really does! Life is so much easier when you stick to it! Good luck! When my boys were still at home I would do a double batch of waffles so they could have them quickly on school mornings. I put wax paper or baking parchment between them so they were easy to separate. It’s such a simple thing that I think so many people miss! The breakfast meals are definitely my favorite time saver! What a great idea! Would be so nice to have meals ready to go throughout the week! It seriously is. I love the idea of pre-making the meats for the week. SUCH a help. I needed this reminder today!! I’m expecting#4 in a few weeks and will use some of these recipes! Yes! Crock pot meals = new moms best friend! With the proper organization, meal prepping is definitely possible, Renee! Your post is truly inspiring and motivating for people who believe this to be impossible to achieve! Thanks so much! It really is and it feels so awesome to be on top of things!